So as to answer to all sectors of activity, we propose many different qualities. Our strengths : Flexibility, speed and reactivity. Our facilites are located in the heart of the South West of France. Our permanent concern to meet your needs effectively, leads us to invest in all the fields of the company, which enables us today to lay out modern production equipments of pressing, casting, extruding and firing. We design your pieces and structures by using a 3D CAD software. With the aim to better control the whole process, we have invested in a CAM software which assists in all operations of the manufacturing from the design of your project to invoicing. We are present in more than 20 countries either directly or through local agent. We are also present at various trade fairs. 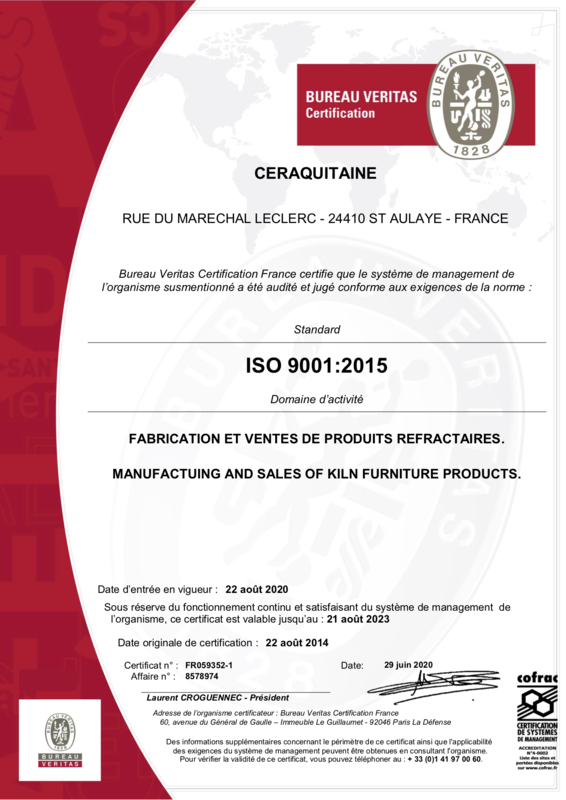 CERAQUITAINE acquired the international standard certification for quality management system, ISO 9001:2008, on August 2014. We are committed to customer satisfaction achieved by providing high quality products and work to improve customer satisfaction. The environment, just like safety, are also associated to this global and coherent policy. I am committed to promoting the process-approach and the risk and opportunity analysis throughout our process. I ask everybody to consider all above mentioned aspects and to come together around our quality system. To continually improve the quality system and to stay in an improvement process, I am committed to provided the resources need to achieve our objectives. The permanent analysis of the customers needs, feeds the R & D : By showing of pragmatism, new compositions, new forms, new processes are developed within the company, to always stick closer to the markets. Remember the past to create a better future. The company is founded in Saint Aulaye, on “the Charentes clay basin” located just 1 hour from Bordeaux. LAFARGE GROUP leader in building materials, acquires the factory. The production manager takes over the company. Investment of over 1 Million of Euros in fast manufacturing and firing equipment.